It probably comes as no surprise that I try to schedule my favorite fun activities around my monthly cycle. It just makes so much sense–after all, during each week of your cycle, you enjoy certain activities more based on how your hormones are impacting you, for instance, your mood, patience, energy, desire to socialize, physical aches and pains and food cravings. So, today I’m giving you a Hormonology Guide that offers a quick run-down of the kinds of fun activities you’re more likely to prefer each week of your cycle. Then, scroll down to see how I just used this Hormonology Guide myself. And, as an added bonus, I share my favorite fall recipe for pumpkin cobbler. After you try it, your life will never be the same…. Oh, on the first or second day of your period you may feel like holing up at home if you get cramps, migraines and/or debilitating fatigue due to menstruation. However, as your Week 1 goes on, your level of estrogen rises–and your desire to socialize, chat and connect with others rises with it. This makes it a great week to reach out to friends, family members, co-workers, neighbors–anyone who you enjoy being around or want to forge a closer bond with. You’ll also enjoy meeting new folks by joining clubs, signing up for classes, attending networking events or simply heading to places where lots of people congregate, like coffee shops and night clubs. You’re also in the mood to spend, spend, spend as estrogen levels rise. So, you’d enjoy going to stores, bazaars, flea markets and other places you can splash out some cash. As estrogen continues to climb in your Week 1, it puts you in a more playful, fun-loving mood, which makes you up for doing practically anything that’s a little silly, such as playing miniature golf or entering a costume contest. Seriously, if you don’t schedule an activity that makes everyone around you say, “Holy smokes, you did what?? ?” during your Week 2, then I’m totally not doing my job here. On these days, high estrogen and testosterone ratchet up your mood, confidence, energy, derring-do and optimism to cycle-long highs. This makes it the best week of your cycle to do something that requires a ton of guts, like rock climbing or riding the biggest, scariest rollercoaster you can find. Not into scary stuff? No prob! Then harness these high hormones to do something that’s sure to totally impress folks, like building a tool shed or welding an awesome sculpture. These peaking hormones also have you feeling social, so you’ll enjoy spending time with folks and chatting up a storm. Like Week 1, you’re still in the mood to spend like there’s no tomorrow–or at least no bill that’s due tomorrow. So, shopping sprees with pals seems like an obvious choice. As estrogen dips and progesterone rises, things have a tendency to change a bit for you: You’re quieter, more subdued, more reflective and sentimental, less energetic and are more likely to prefer activities you can do alone or with one or two people you feel close to as opposed to a crowd of folks you may not know well. Your desire to spend is replaced by a desire to save. And you’ve got the progesterone-fueled munchies–big-time. So, what kind of fun activities would you enjoy most this week? Ones that are more sedate and introspective, for instance, scrapbooking, knitting, reading or putting more time into practicing your guitar. When looking for activities to do out in the world, you’ll likely prefer lectures, visits to the museum, long walks and coffee with someone who you feel connected to on a deep level. This means you’d probably either enjoy visiting your favorite bakeries and restaurants or heading to the kitchen and whipping up much-loved recipes. And, because progesterone is bringing out your nurturing side, chances are, you’d also enjoy whipping up treats for friends and family while you’ve got the baking supplies out. As estrogen nosedives in this premenstrual week, it’s dragging down your mood, energy and patience, plus it’s prompting a bit of clumsiness and making aches more achy and pains more painful. Not exactly a recipe for going rock climbing, which requires a lot more coordination and pep than you’re mustering right now, or to a crowded concert where for sure some drunk dude is gonna step on your feet and do that annoying high-pitched finger-mouth whistle thing in your ear all night and make you fantasize about drowning him in his 11th beer. So, what kinds of activities will you enjoy more in your premenstrual week? The kind that are special because they’re indulgent or because you only do them once in awhile. For instance? Maybe it’s taking a long, warm bath with a luxurious bath bomb, getting a massage, binge-watching your favorite TV show, shopping at a cute little boutique that’s kinda pricey but has really neat stuff or ordering a meal from a favorite restaurant you don’t get to often. If you find it difficult to treat yourself well, then consider this: Indulgences like these help counter premenstrual negativity and discomfort by triggering a flood of feel-good, pain-masking brain chemicals that make your Week 4 so much better. So, it’s downright medicinal. 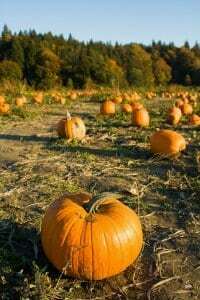 September 23rd is the Autumnal Equinox–a time when we folks in the northern hemisphere will be welcoming fall, which is my absolute favorite time of year. The colorful leaves that make hills look like they’re covered in Fruity Pebbles, the crisp air whose peppery scent clings to your hair, the way the sun changes angles so it makes everything look like a soppy photo in a Hallmark greeting card. What’s not to love about this season? Well, right now I’m in my Week 3–a time when a rise in progesterone can prompt wistful feelings and conjure sentimental memories. So, I’m currently wallowing knee-deep in sigh-evoking recollections of autumns past. On top of that, my rising level of progesterone is prompting cravings for sweet, creamy, rich, yummy comfort foods. Together, these progesterone effects have inspired me to plan my annual fall tradition: To celebrate the arrival of autumn, I bake a gazillion pumpkin cobblers and hand them out like political leaflets to friends, neighbors, my husband’s students, car wash dudes, basically anyone who gets within a five-foot radius. Here’s the thing though: When doing the math, I realized that the Autumnal Equinox is going to occur during my premenstrual Week 4–making me a bit clumsier in the kitchen and less patient when I mess up. So, being aware that Week 3 is really the best cycle week for enjoying a bake-athon and appreciating scrumptious baked goods, I’ve decided to do my annual baking ritual early this year. That way, I know I’ll enjoy it to its fullest. And, since I can’t send pumpkin cobblers through email…yet (hey, if they can put a robot on Mars…), I’m doing the next best thing: Below I’ve included my prized pumpkin cobbler recipe. It’s SO easy. And yet everyone you give it to will swear you spent hours making it. Enjoy! And happy Autumnal Equinox–a little early! In a bowl, mix pumpkin, eggs, sugar, salt, ginger, cloves, cinnamon and evaporated milk until fully blended. Pour into greased 13” x 9” x 2” pan. Sprinkle dry cake mix over the top of the pumpkin mixture covering it completely. Slowly drizzle melted butter over the dry cake mix so it doesn’t puddle. Sprinkle brown sugar over the butter. Top with sprinkling of chopped nuts. Bake in 350-degree oven for 1 hour 20 minutes–until pumpkin mixture is set and top is golden brown. Cover with foil and bake at 350 degrees in toaster oven or conventional oven for 10 to 15 minutes.